MONTREAL -- The Green Party of Canada's encouraging result in a federal byelection in a Quebec riding last week has deputy leader Daniel Green hopeful the party can make a major breakthrough in this fall's general election. Green, who finished third in Outremont behind the Liberal and NDP candidates, believes it's possible Quebecers could once again choose to shift their vote en masse to a new party, as they've done previously, and send as many as five or six green party MPs to Ottawa. "Quebec at the federal level has always voted in waves, which have changed Canadian history," he said in an interview. "We did it with the Bloc Quebecois, we did it with the NDP. Now, it's the Greens' turn." Green earned nearly 13 per cent of the vote in Outremont, finishing ahead of the candidates from the Bloc Quebecois and the Conservative Party of Canada. It's a big improvement over 2015, when the party won only 3.6 per cent of the vote. He believes the numbers show Quebecers are starting to see the party as a "useful" group with concrete solutions to problems such as climate change. The party, he added, is already scouting a team of experienced candidates for the next election. "These are mature people, who have already seen snow, some have already done municipal politics, some have done federal politics, have been candidates for other parties," he said. 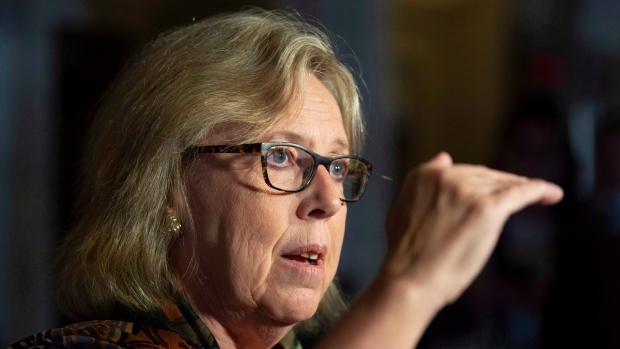 With the Bloc Quebecois and NDP struggling in Quebec, and the Liberals mired in the fallout of accusations from the former attorney general, the Green party is hoping some of the left-wing votes will swing its way. But how much chance does the party really have to elect its first Quebec MP? Philippe J. Fournier, a columnist with L'Actualite magazine and creator of political site 338Canada, believes the party will need to attract a big star candidate in order to win a seat -- and it had better be the right one. "Mr. Green, in Outremont, who got 12.5 per cent, that's a high point for the Green Party of Canada in Quebec," he said. "To really make a breakthrough in Quebec, it will take a really big name, because there is no riding that's takeable, or even close to being takeable." Actor and comedian JiCi Lauzon, who is well-known in Quebec, ran for the party in 2015 in a riding south of Montreal, but only managed to win 8.5 per cent of the votes. But Fournier said the party could certainly play a role in the election, mostly to the detriment of the NDP. "As much as Maxime Bernier is cannibalizing the right, we can equally see that elsewhere in Canada, especially in the Maritimes and British Columbia, the left-wing, environmentalist vote is leaving the NDP for the Greens," he said. He says that if the Green party manages to recruit a star, their best hope may be in two Montreal ridings, Laurier--Sainte-Marie and Hochelaga, which are both represented by NDP MPs who have announced they won't be running in the fall. According to a Leger poll in February, eight per cent of Quebecers said they would vote for the Greens if the federal election took place today. But that number could go down on election day, since voters often tend to opt for the big parties that they feel have a better chance of winning. "It could be a big balloon that bursts, but it's been several months that we're seeing in Quebec that's it's eight, nine, 10 per cent...that would be a very good score for them," Fournier said. Green is very aware that encouraging poll numbers may not materialize on election day, but he's hoping to convince Quebecers that voting Green is worth it. "The challenge in October, is to tell our Green voters to vote Green," he said. "Vote Green, it's Ok. It's a useful vote, a Green vote. It's a vote that's necessary to send the message."